Co-founders of 13&9, Martin Lesjak – the international award winning architect and CEO of INNOCAD and 2015 Contract Magazine Designer of the Year – and Creative Director, fashion designer ANASTASIA SU, who’s vision and unique perspective enhances her team’s interdisciplinary process and provides the strategic roadmap for the team, are presenting the lecture together. The keynote speech will embrace 13&9 and INNOCAD Architecture’s collaborative efforts and the vision behind the processes of both firms through key words as well as examples of the multidisciplinary work. NeoConcept by 13&9 is unisex fashion accessory exploring new technology through its material and fabrication demonstrating the endless flow of people gathering, products and information through the use of the key word – NEOCON. This message is articulated through the “N” as the first and last character in a band that builds the foundation for a round bracelet, whose construction has no seems, is a continuous loop and has smooth elevated characters representing the consistent dialogue between innovation, individuality and NeoCon’s corporate identity. NeoCon is North America’s largest design expo and conference for commercial interiors, with 50,000 architecture and design professionals attending and thousands of products and resources for corporate, hospitality, healthcare, retail, government, institutional and residential interiors from more than 700 showrooms and exhibitors on view. Mohawk Group, the world’s leading producer and distributor of quality, cutting-edge and sustainable commercial flooring, will launch this collaboration at NeoCon, North America’s largest design exposition and conference for commercial interiors. Moving Floors epitomizes Innocad’s 13&9 approach to design, which is a unique dialogue between the individual and the environment with a focus on concepts of modularity, compatibility, flexibility and transformation. 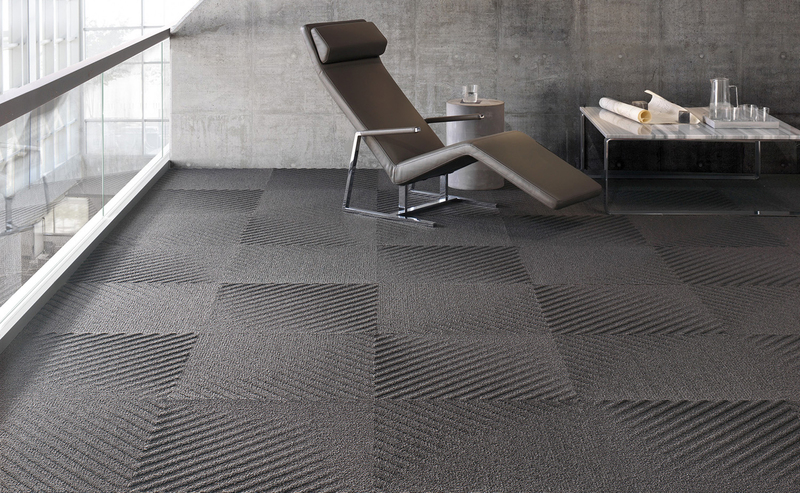 The collection – or flooring system – is inspired by the individuality of nature with varying patterns that are designed to be dynamically moving based on the user’s changing point of view. The collection’s diverse patterned tiles create an indoor landscape and feature a mix of geometric patterns and coordinating solid textures in a sophisticated color palette. Over the years, Mohawk Group has created a successful collaborative partnership program with interior designers, architects and product designers throughout the industry – domestically and internationally. The company’s latest partnership with 13&9 expects to explore interdisciplinary throught and creativity in new ways, adding to Mohawk’s diverse product offering.